I was in a bit of bind a few days ago when it came time for dinner. My daughter had a doctor’s appointment and then her/our very first play date. Usually dinner is on the stove by 9am, just in case the day escapes me, like this day did. So, we got home and I opened the fridge and let my right brain win the battle. My left brain knew I needed to boost immunity (for my daughter as well) and I often think of soup when I think of boosting immunity. But the left brain makes making soup complicated, so enter the right brain. As long as you have mire poix (onions, carrots and celery) in the fridge you’re good to go. I took those out along with the fennel and parsley and got to cutting. 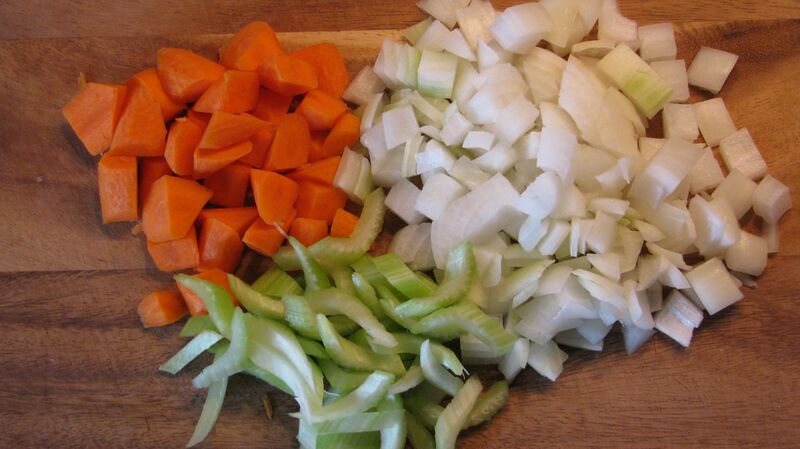 Instead of making 1/4″ dice for the mire poix (yes, I love to practice my knife skills) I chose bigger more decorative cuts since these would be the stars of the soup. Read on to see how this improvised soup came to life. 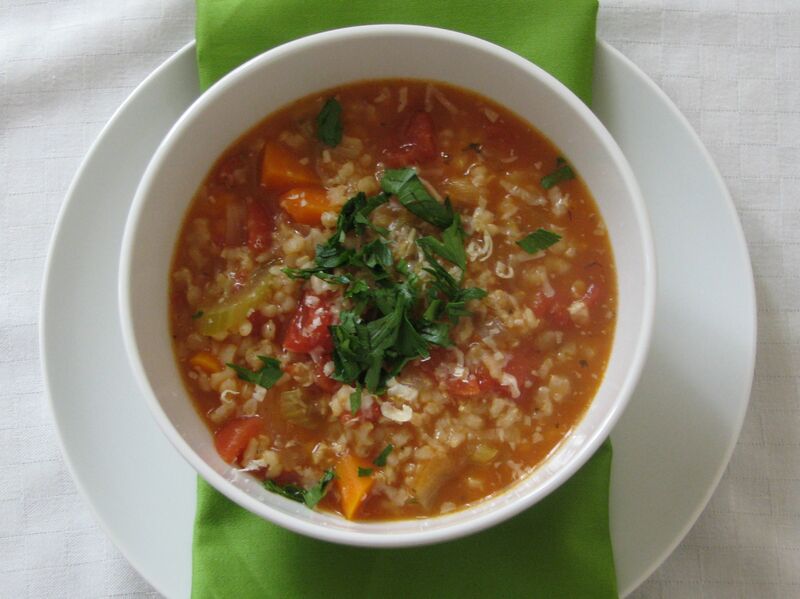 Oh, and yes I am aware this is the second minestrone I put up on these pages, but it is just such a simple and delicious soup that can be adapted for every season. Trust me, this one should be a staple. 1. Heat oil in a saucepan over medium heat. Add onions and a pinch of salt and cook for 5 minutes until tender. Add carrots, celery and oregano and cook for 5-7 more minutes until very fragrant and tender. 2. Add tomatoes with juices and then add rice. Let cook and simmer together for a few minutes just to let the flavors get acquainted. Add bouillon and water and partially cover. Cook for about 30-40 minutes until the rice is done and soup is a bit thicker in texture. This is one of only 2 recipes that I don’t adapt, change, or alter in any way simply because it is so delish as is! (Except that I eyeball amounts for everything instead of measuring…it’s a soup thing!) 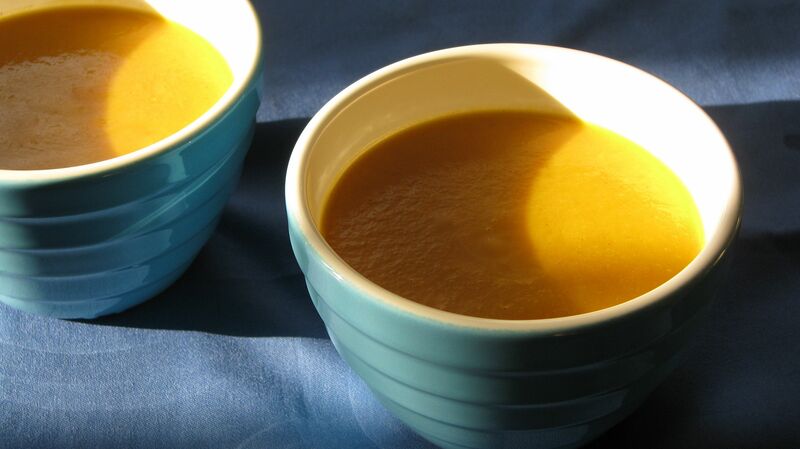 It’s such a refreshing departure from the overused Carrot Ginger Soup. Of course that one is quite delicious too, but it seems no one cooks carrot soup any other way these days! I came across this recipe while working for a client. She loved this soup so much, she even ate it for breakfast! Rebecca Katz’s cookbook, “The Cancer-Fighting Kitchen”, is a wonderful cookbook for everyone. I have used several of her recipes in my own kitchen and have adapted many depending on who I’m cooking for. But, leave this one alone. I highly doubt anything can make this one better. Fennel is a lovely, if peculiar looking, vegetable. It’s delicious raw, pickled, sautéed, braised, you name it. It is a digestive aid and is anti-inflammatory, thanks to its unique phytonutrients. Anethole, a specific phytonutrient, has been linked to reducing inflammation and the occurrence of cancer. Fennel also boasts high levels of Vitamin C (yay, more anti-oxidant power), fiber (think healthy colon and lower cholesterol) and folate (a good choice for you pregnant mamas). It’s also a good source of potassium. I just get so excited when something SO delicious is SO good for you, too! 1. In a soup pot, heat oil over medium heat and add onion and fennel with a pinch of sea salt and sauté until tender and fragrant. Add the carrots, orange zest and spices and another pinch of salt and sauté until combined well. 2. Add about 1/2 C of water/stock and cook for about 5 minutes before adding the rest of the water. Cook until carrots are tender, about 20-30 minutes. 4. Return the creamy soup to the pot over low heat and add the orange juice and lemon juice. Heat for a few minutes to incorporate the flavors.